Nestled in the desirable enclave of Pacific Hills, this model-like residence boasts an open, flowing 1,900+ SF floor plan set on an extra-wide lot. The residence has been meticulously maintained and upgraded with plantation shutters, LED recessed lighting, custom built-ins, closet organization systems, Nuvo water softening system, and bathrooms updated with the finest finishes. Upon entry, 2-story ceilings with an abundance of windows welcome an influx of light into the living room and formal dining area. Gleaming wood floors lead into the great room where a media/ living area adjoins the backyard featuring stylish drought-tolerant landscaping and designer lighting, with a chefâs kitchen that is highlighted by S.S. appliances, a custom island, and mosaic tile backsplash. A first floor guest bedroom or office and adjacent full bath complete the lower level, while the 2nd level reveals two secondary bedrooms, an updated jack-and-jill bath with dual sinks, and the master bedroom with voluminous ceilings and spacious en suite bath. 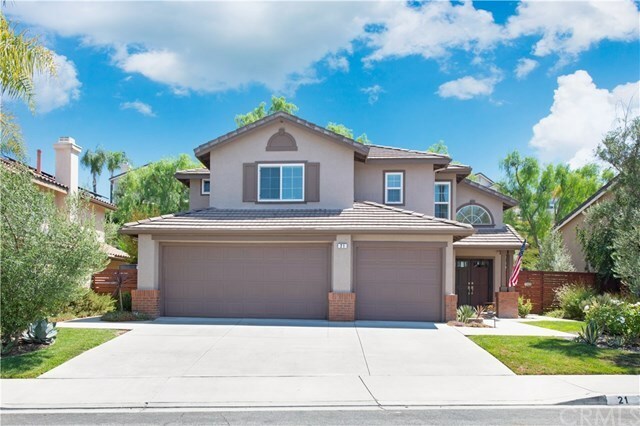 Additional highlights of the home include ceiling fans in all 2nd level bedrooms, new air vent grills throughout, built-in audio in the great room, a WIFI-controlled thermostat, replacement windows, new water heater, and a 3-car garage with epoxy floors and built-in cabinets. Close to parks, great schools and shopping, this Pacific Hills home enjoys endless perks plus Lake Mission Viejo membership privileges which includes swimming, boating, and more.